Drain Cleaning issues for homeowners and businesses. There is nothing fun about finding yourself with a blocked or clogged drain or water overflowing into your home or business. When this happens most people often to try chemical options like draino first to try to resolve the problem and sometimes it may but when it does not, you may find yourself needing the help of a licensed, professional plumber from Keemer Plumbing. Kitchen Drains – Grease, soap and food can take a toll on your kitchen drain system causing clogging and slowing drainage over time. Bath & Shower Drains – A slowing of the drain in your shower or bathtub is usually caused by soap, hair buildup. Water should drain within a few minutes after using your tub or shower, if not you probably need a drain cleaning or repair. Bathroom Sink Drains – Toothpaste, soap, grime and hair can result in slow draining or clogged bathroom sink which needs cleaning or repair. And ever if you should lose something down your drain, quickly turn off the water and give us a call, we’ll come rescue it for you. Toilet Drains – A toilet can become clogged when facial tissues, baby wipes, sanitary products or other items which don’t disintegrate as toilet tissue does has been flushed down the toilet. We have methods of clearing the items from the toilet drain, allowing it to flow freely once again. Floor Drains – Drains in laundry rooms, basements, older bathrooms, garages, patios and driveways are installed to receive water to prevent flooding. These types of drains are typically equipped with a trap that should have water in it to keep any odors and sewer cases from leaving so it is a good idea to pour water down these drains periodically, especially if you ever smell an odor. 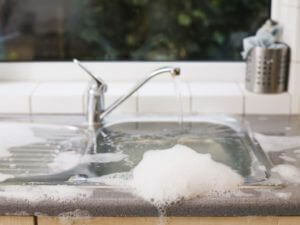 Regular cleaning of these drains is recommended to prevent major clogs. If you think you might be having a problem with your main sewer line, we will come diagnose and solve any issues you might have learn more on our Sewer Main information web page. 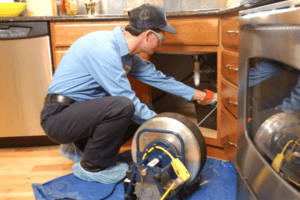 But for those times when it does not, regardless of whether it is the toilet, bathroom or kitchen sink, we here at Keemer Plumbing are here to help, we have solutions to resolve the drain cleaning blockage or clogged drain problem! We service the West Valley, Salt Lake City and Kearns Ut metro areas of the Wasatch Front! You can send us a text message or call us at: 801-414-7904 or email us today! We will get your drain unclogged asap!